Homeownership Education - Asian-American Homeownership Counseling, Inc. Homeownership Education - Asian-American Homeownership Counseling, Inc.
AREAA DC Metro Housing Fair, June 19th 2010. 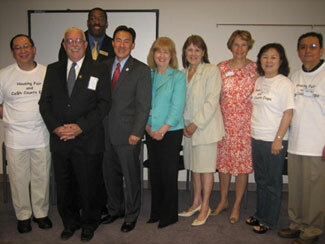 From left: Vinh Nguyen, Chairman, NVAR; Gerry Connelly, US Congressman; Scott Willis, Chairman, AREAA DC Metro; Mark Keam, VA State Delegate; Paula Sampson, Director, HCD; Nannette M. Bowler, Director, Family Services; Christine Todd, CEO, NVAR; Song Hutchins, President, AREAA DC; Tony Yeh, AREAA Board. Are you considering purchasing a home? Seven Things you should know before a purchase. Mortgage 101: What type of mortgage is right for me?